How can we inspire community to use public space for their activities? “I will be the Star” proposal is balancing on the edge of being inside and outside. As a public space installation, it invites people to meet and have common activities. Communities can use “internal” spaces for various happenings as concerts, lectures, performances, parties or just shared lunch or dinner. It can be used for school education as well. External edges of a star offer a place to hide, to have more privacy, while still being a part of community. How can we attract attention and welcome visitors to Papirøen? Lyrical shaping of manipulated star is coming out of view possibilities. To fit a star to the site, corners of the star are lifted up, until they meet projected site boundaries. As center of a star is asymmetrically moved from site, projected corners are creating landscape to attract attention of people. It works as good meeting and orientation point as well. How experiencing the view may be something for people to share? Southwest corner of the Papirøen Island offers everyone magnificent view of the CPH city. This is a spot where we see important parts of the city being developed into 21st century modern metropolis. A place where various communities, that currently occupies the island, are going to meet each other and have space to share. 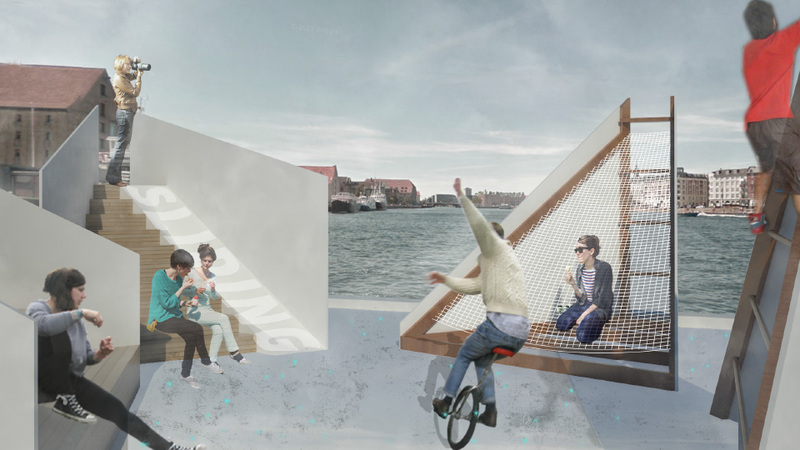 Urban furniture of the Star is going to mark an island, as one of the representation of being modern and show a potential for further development. How can we orchestrate the spectacular view of the water and the city? How to relate to the industrial harbor history of the site? Sturdy materials are used to minimize maintenance needs. Timber internal structure offers easy-to-made solution to support walls, wooden floor, relaxing net, slide or ladder levels. Walls of auditoriums are created out of plywood (OSB) with white paint that reference to the color of paper. Recycled materials can be used to fit into budget better.